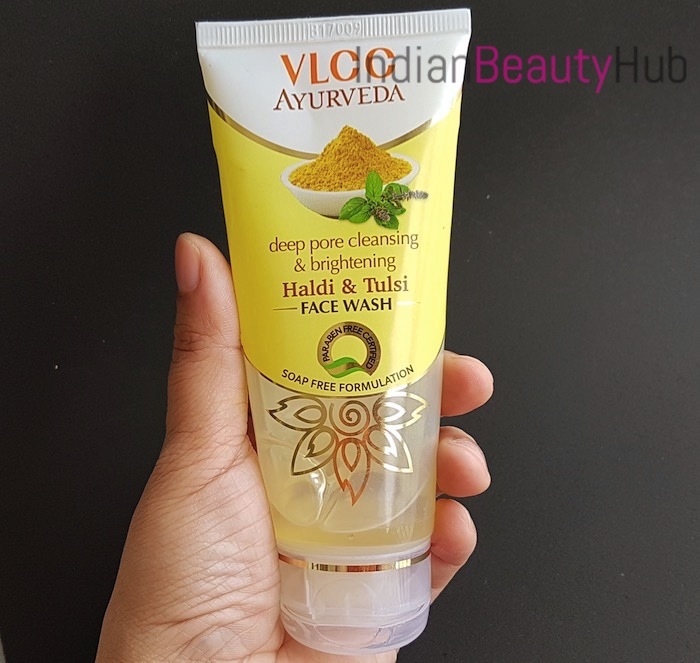 Hello everyone, today I am reviewing the VLCC Ayurveda Haldi & Tulsi face wash that I have been using for the past one month. 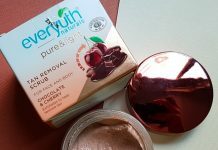 VLCC is a well known wellness and beauty brand and their facial kits are my absolute favourite. VLCC has recently launched their Ayurveda beauty range comprising of 4 variants of each face washes and facial kits. You can check their entire range of new products at their official website here. 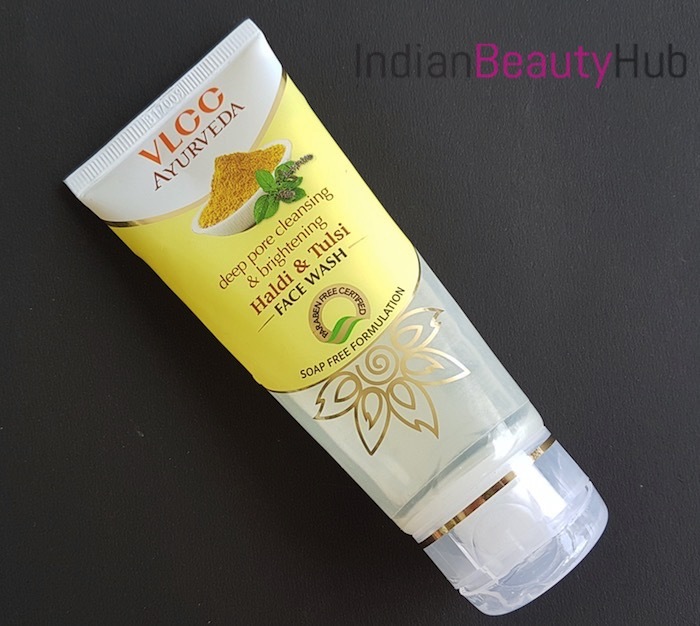 Packaging: VLCC Ayurveda Haldi & Tulsi face wash comes in a sturdy plastic tube with flip open cap. 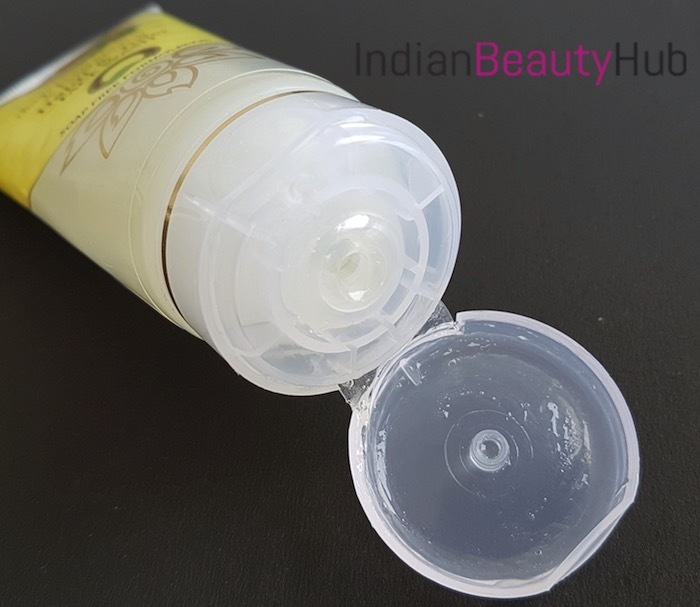 The tube packaging is hygienic, spill-proof, and travel-friendly. It is not very convenient to use as it spills out extra most of the time while opening the cap. 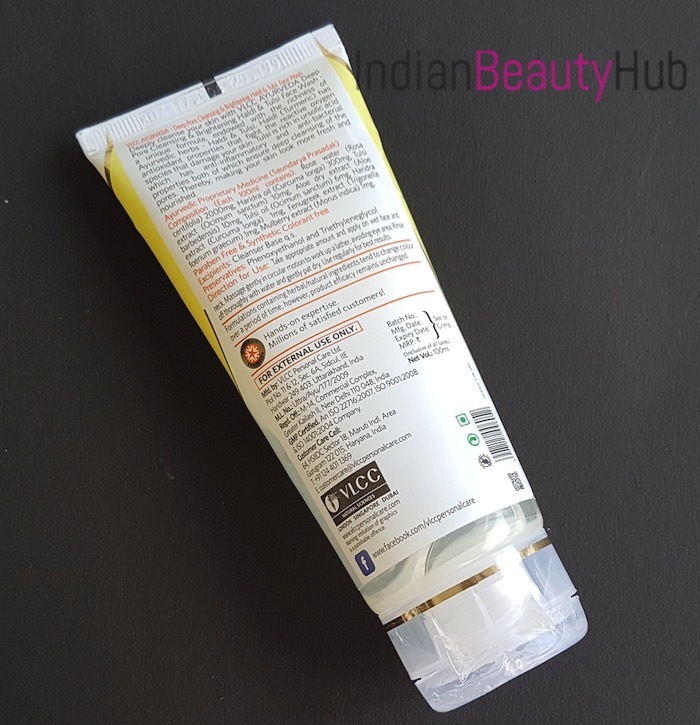 The tube contains all the important product related information like ingredients, expiry date, price, etc. 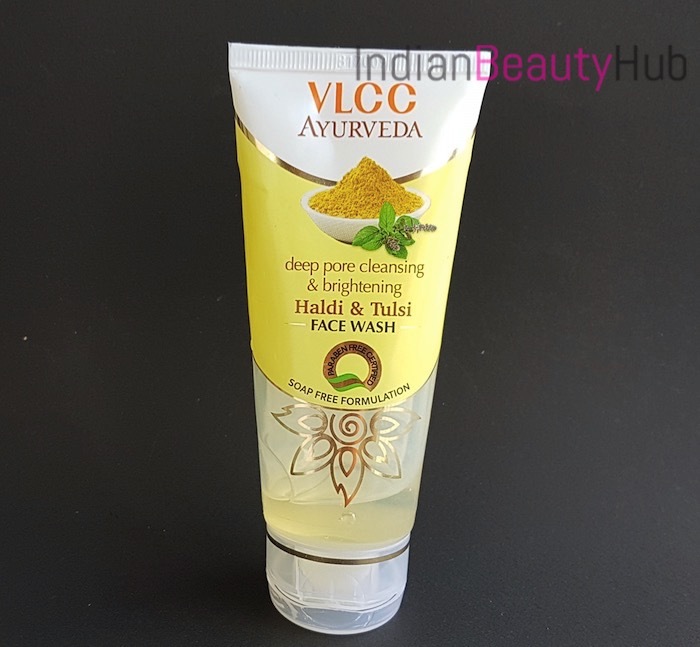 Price & Availability: The price of the VLCC Ayurveda Haldi & Tulsi face wash is Rs.55 for 50ml and Rs.99 for 100ml. It is easily available at local beauty and departmental stores or you can buy it online from vlccpersonalcare.com. 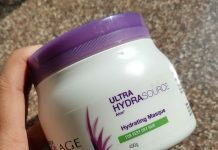 My Experience: The face wash comes in a gel base and has a very light yellow color. It smells almost like a raw turmeric, which I quite liked. I generally take a small amount of the face wash, rub it between my fingers and massage it nicely on my wet face and neck. It lathers moderately yet cleanses the skin nicely, removing dirt, impurities and oil. It washes off with few splashes of water, leaving the skin clean and fresh. I have been using this face cleanser twice a day(morning & evening) since last month and it really worked well for my combination skin. It is a mild face wash that removes impurities from skin without any irritation. I do have acne prone skin and it has not aggregated my acne neither did it cause any irritation. A soap free face cleanser that removes impurities and leaves the skin clean and refreshed. 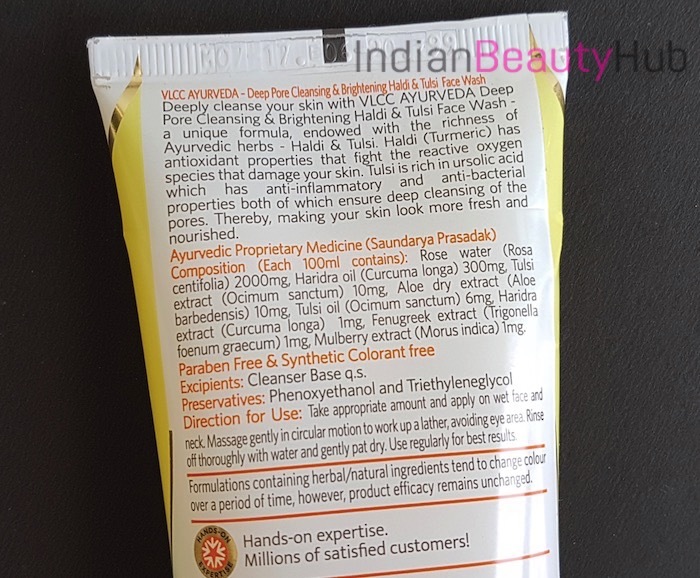 It is an Ayurvedic formulation and is free of Parabens and Synthetic colorant. It helps reduce pimples and minor blemishes. Didn’t cause any allergy or irritation to my acne prone combination skin. Suitable to use by both men and women. The complete ingredient list is given on the tube and they’ve also mentioned the preservatives used in its making. Two size options are available to choose from – 50g and 100g. The skin brightening claim is not completely true. Honestly speaking I don’t think just a face cleanser can make skin brighter. People with dry skin can skip it as it might leave their skin dry and stretchy. Gets wasted while opening the cap as it spills out extra, might be due to tight cap. 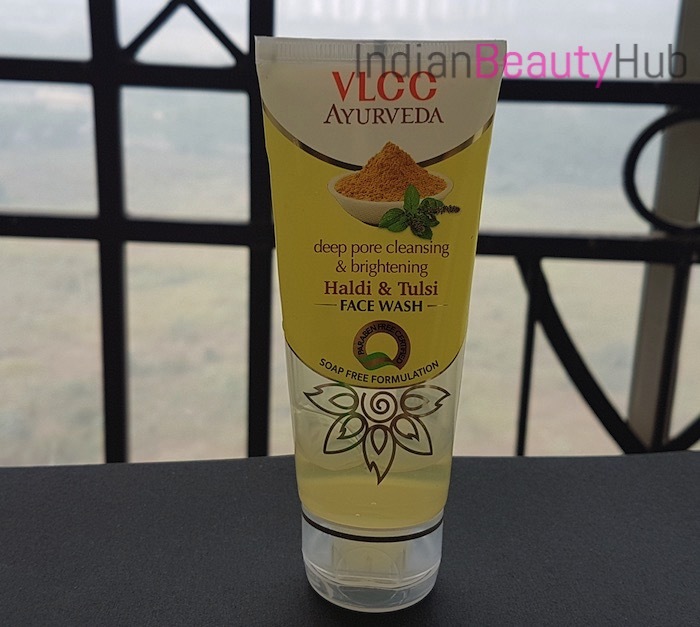 Overall it is worth trying VLCC Ayurveda Haldi & Tulsi face wash as it works great as a daily face cleanser. 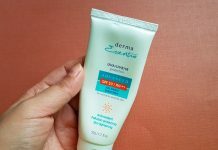 If you are looking for an affordable and Parabens free face wash then you should definitely check it out. Recommended! Haven’t used this product. But lovely review, covers pros and cons with balance.